In the mid-1990s, a grandmother gave her son two gold charms. She was an artist and had crafted these gifts herself to feature the unique fingerprints of each of her granddaughters. When her son woke up in the middle of the night clutching these charms, he was struck with the idea to create similar custom keepsakes—personal jewelry that would mean as much to others as his charms meant to him. Steadily, Meadow Hill has grown from a middle-of-the-night brainstorm to a nationwide company. The power of the human connection, particularly through touch, guides every aspect of the work Meadow Hill renders. 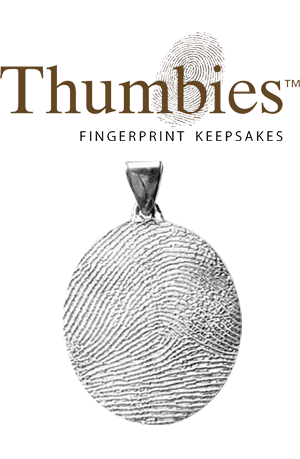 Each keepsake we cast forges a durable symbol of one specific and unique person—a fingerprint. We believe in creating, celebrating, and capturing memories of people and passions important to them. Although our company has grown and changed over the years, we continue to work hard for the same reason: to ignite passion, heart, and soul in the human spirit. Half art. Half science. The creative side of our production process ensures a skilled bench jeweler hand-finishes every piece, texturing, polishing, engraving, and affixing gemstones with care and passion for the deep meaning of each identity-centric keepsake. Polishing takes time to perfect—to learn the contours of each piece, to record in one’s muscle memory the required application of pressure, to guarantee symmetry when the piece hangs from the bail. Our artisans unite decades of combined experience to bend metal to the will of personal expression. The science side of our production process enables, most importantly, a highly precise three-dimensional modeling of your loved one’s print. A lost-wax investing and casting process that uses vacuum technology and sensitively calibrated thermal readings makes sure we pour liquid silver or gold into your mold at the ideal temperature. And high-power microscopes allow our bench jewelers to find with their keen eyes any imperfections and fix them. Half science. Half art. Meadow Hill’s print-centric keepsakes celebrate everyone important in our lives, from newborns and newlyweds to deceased loved ones whose last touch we help ensure will never really be their last touch. With expansive imaginations, our designers have conceived dozens of designs for your loved one’s prints—signet rings, cuff links, earrings, beads, and pendants, to name just a few. A dedicated in-house quality-control team catches imperfections before they go out the door, so that you can wear your piece with confidence, and genuine emotion, the second you receive it. Most people have no problem wearing sterling silver. However, a small percentage of the population has metal allergies and reacts to the alloys used in sterling silver. When worn, their pieces quickly tarnish, turn colors, and in severe cases, cause a skin reaction. If this happens, Meadow Hill can plate any sterling silver piece to make it hypo-allergenic. Please note, Phoenix keepsakes can only be plated once, at the time of original order. If sterling silver jewelry is worn daily, the natural oils in the body generally keep it lustrous for long periods. However, over time or if not worn regularly, a piece can dull or tarnish. Cleaning restores it to its original shine! At the time of purchase, sterling silver pieces can be plated for $20 to minimize the possibility of tarnish or an allergic reaction. You can request this via the Notes section at the time of ordering, or call in to place your order. If your sterling silver piece has already been purchased, you may return the charm to us and plating can be done for $20 plus shipping (with the exception of Phoenix keepsakes). NOTE: Phoenix resins can withstand most household chemicals, but please avoid exposure to DEET, which is commonly found in insect repellants. If your piece is tarnished, first try cleaning with a jewelry cloth. Often times, simply polishing the keepsake will return it to its original shine. If your piece is heavily tarnished, first remove the tarnish with a liquid tarnish remover following the manufacturer’s instruction. It only takes a second or two. Never submerge jewelry with stones (synthetic or genuine) in tarnish remover or leave jewelry in the liquid for longer than a few seconds. Use a good silver cream polish to restore the shine and place a protective coating (and tarnish resistor!) on your piece. These are available in most hardware and grocery stores. Again, follow the manufacturer’s instructions. Meadow Hill warrants its products to be free from defects in materials and workmanship for a period of one year. Outside of this first year, repairs to damaged or worn pieces will be quoted based on standard jewelry repair costs. The print(s) used to create your custom keepsake can be used again for reorders or for purchasing additional keepsake styles. In the event you wish to reorder, simply contact your original order source or call our Customer Service team toll-free at 877.848.6243 (847.381.9000 if outside the U.S). If ordering a keepsake from the Phoenix Collection, we suggest you hold on to the un-used cremated remains that were returned to you with the original order, as these can be used for additional keepsakes, or in case of loss or damage to your original piece. Click here to edit.